This post has been sponsored by Rubbermaid. All thoughts and opinions are my own. Who loves a good movie night? We do! Who loves a good organization project? I do! Combine the two and you have happy (and yummy!) organizing fun! Any Saturday night that my girls and I are all home, we have a weekly family movie night. We used to do this years ago on Friday nights, but then things got too busy so it faded from our family life. Last summer, we revived our movie night. Of course with movie night revival, we needed some fun treats to go along with it. Life has been busy(I'm sure you know exactly what I mean) and when we are busy, things tend to get a bit disorganized and messy because we don't take the time to organize them or keep them organized. So, I knew that I needed to add organizing our movie night goodies to my new year organization projects. I've got some great ideas for your movie night stash as well. 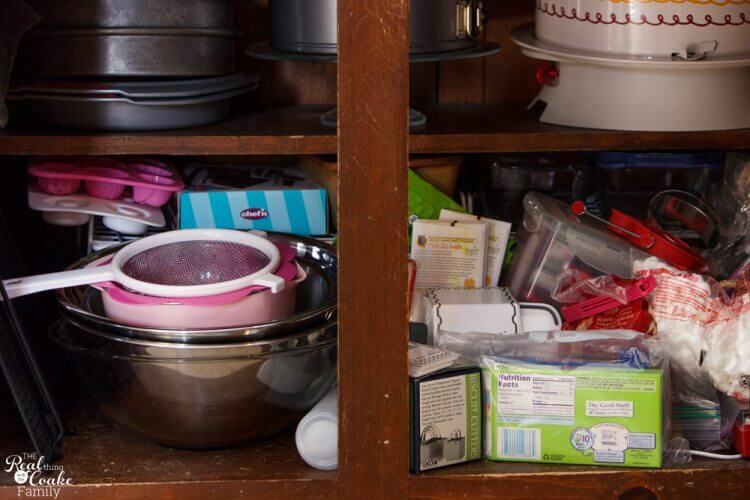 When you tackle any organization project, you want to start by gathering all the stuff you currently have. For us, that included a set of popcorn bowls I've had for years and a new popcorn maker that I got for Christmas. And all of this stuff! We had been buying some of the little boxes of candies and other treats for our movie nights. They started off organized but as you can plainly see, they became quite a mess in this cabinet. After you have gathered all of the stuff you currently have, you need to purge. Get rid of anything that you haven't used in a month or two. Don't save it for a rainy day because that just leads to more disorganization. In this case, keep only what you will eat. 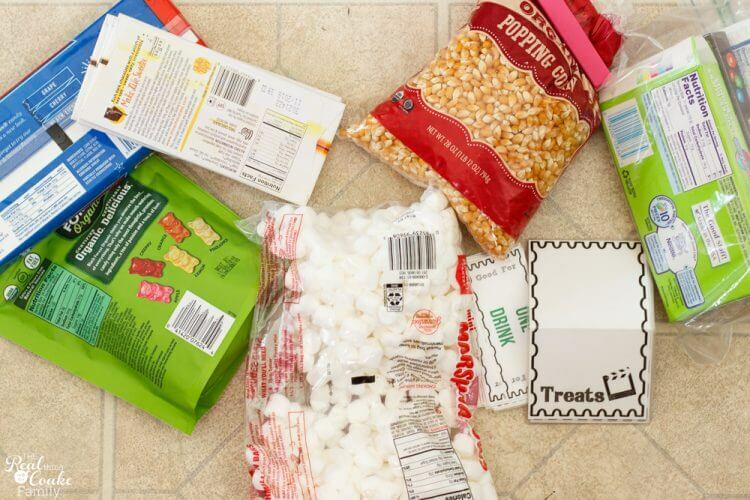 Packages that have been open for a while are likely stale and are not going to get eaten if they haven't been already. Once you know what you will be keeping, group like things together. 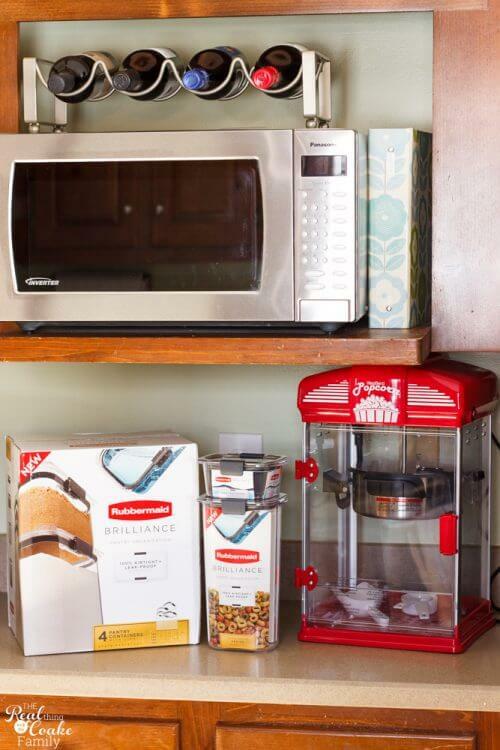 In this case that will likely be grouping your food items together and the bowls, popcorn maker, tickets, and any other non-food items together. 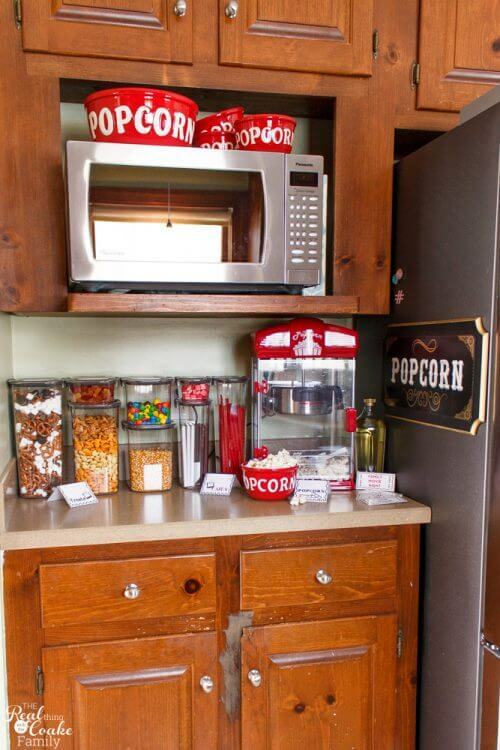 Once you know exactly what you are keeping, you can select the best space in which to keep your movie night items. Keep in mind proximity to where you have your movie night as well as the fact that you are likely storing and making food. For our house, that means we are keeping things in the kitchen. I decided that this little-used counter by the refrigerator would work well for our movie night fun. The popcorn maker fits just perfectly under the shelf for the microwave. Next up, I needed containers for the food items. I wanted something that was BPA free as well as air-tight so that the food would stay fresh longer. Our little zipper bags weren't working to keep things fresh. Plus, pretty containers make the food even more appealing and make it more fun to go select items for our movie night (which is the one night of the week that we eat a ton of sugar and such. 🙂 ). 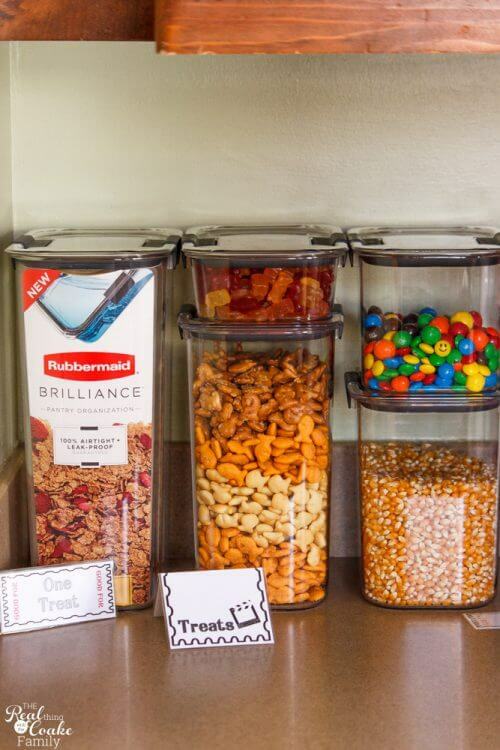 The Rubbermaid® BRILLIANCE™ pantry organization line is perfect for our movie night organization. I love the pretty crystal-clear containers. It shows off what is inside so well. Now it is time to put the things you are keeping into your containers. My daughters and I decided together what would go in each container. 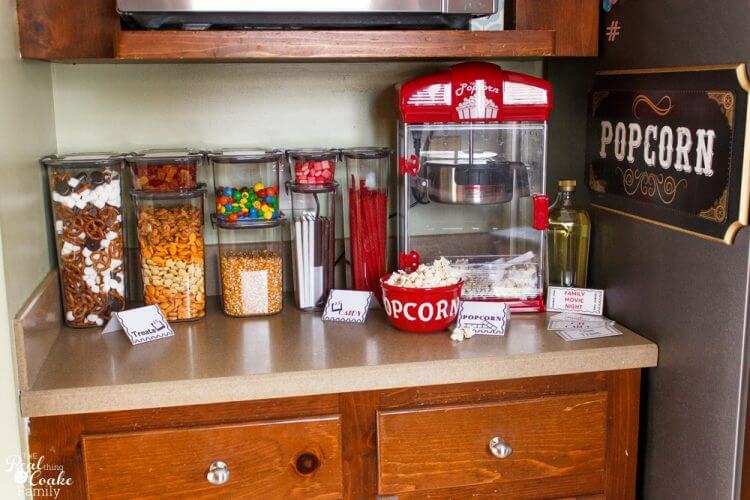 We had fun selecting and adding a few new things for our movie nights. 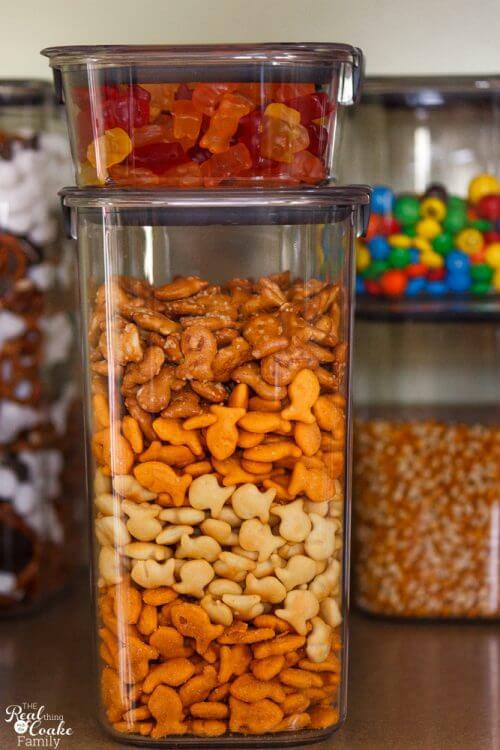 Just keep adding your food or other goodies to your containers until you have filled them all up and they are ready to go. 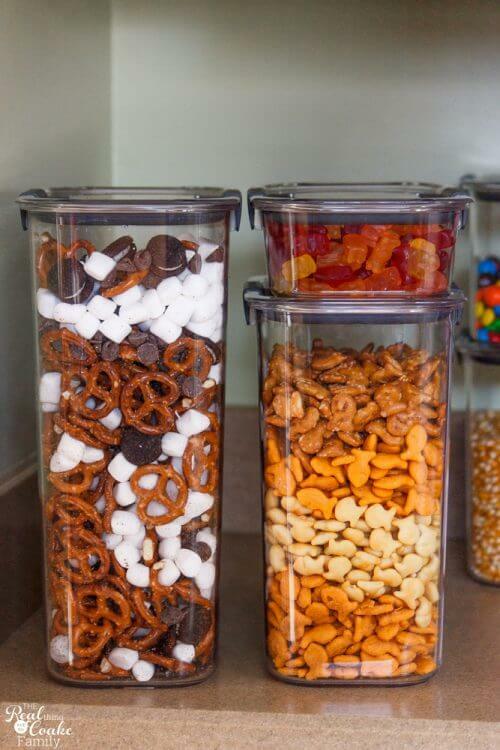 These containers are stackable, so you can use the space you have available well. Chocolate! 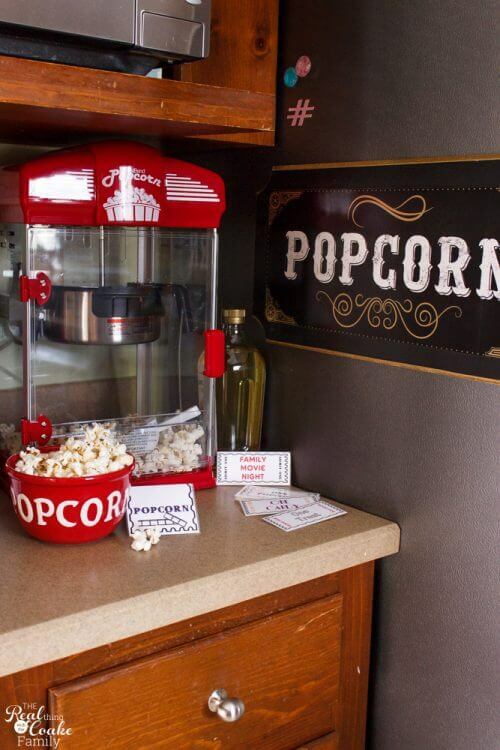 It is a must for our movie nights, how about you? We like to make up big bowls with a bunch of stuff in them, both sweet and savory, so we needed a big container of cheese crackers along with our favorite organic gummy bears. 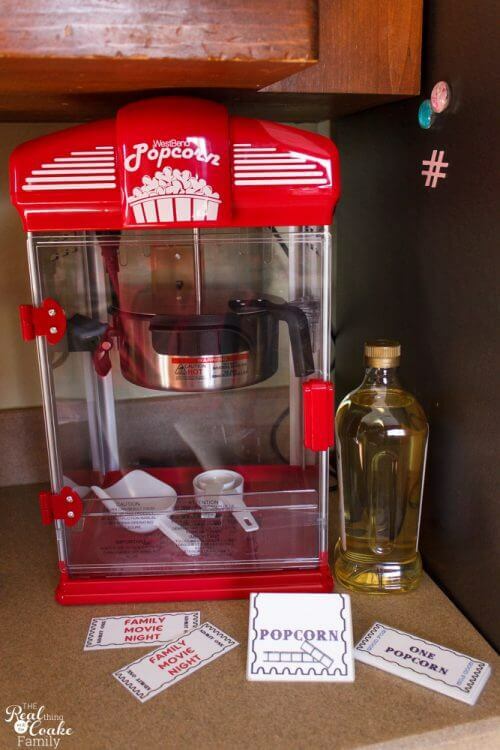 You can think outside the box with your movie night fun. 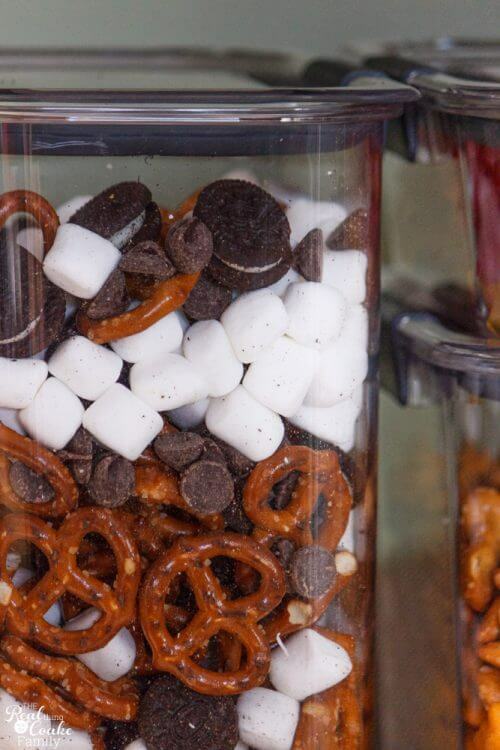 We created a ‘mix' of pretzels, chocolate mini cookies, chocolate chips and marshmallows. It is SO yummy! Normally at this point, I tell you to label everything because it is a super important step in organization. However, this time I decided not to label the containers and I think it is OK not to label this project. 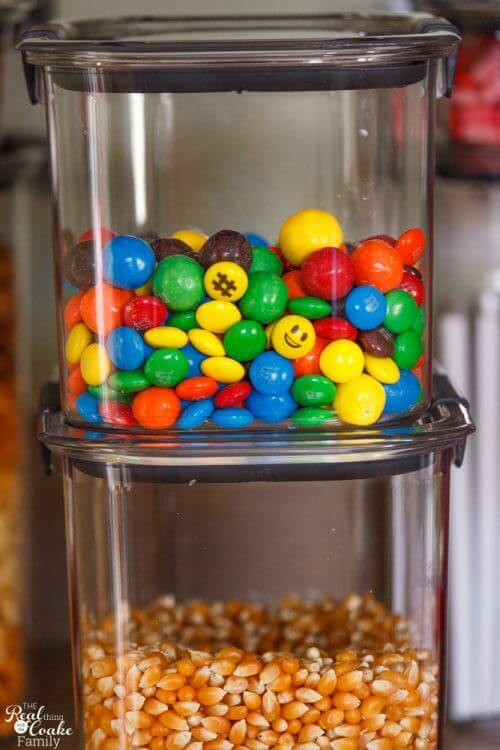 I know we will change our movie night food each time the containers are empty and I'm sure you will do the same. So, it doesn't make sense to label the containers. Also, the Rubbermaid®BRILLIANCE™ containers are so bright and clear that it is super easy to know exactly what is in each container. For our house, this is our new movie night set up. 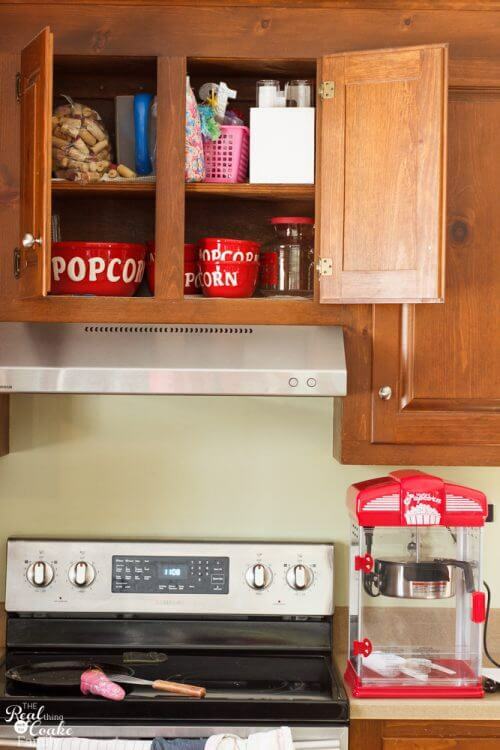 I moved the popcorn bowls to the top of the microwave so that everything was together in the same location. 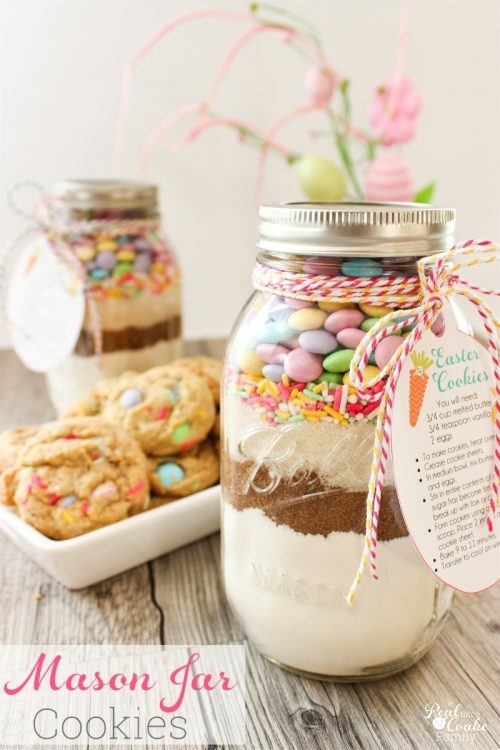 It looks so fun…and yummy! Then as we used our new movie night set up, I ended up moving the bowls and the food containers to the cabinet up above the microwave. 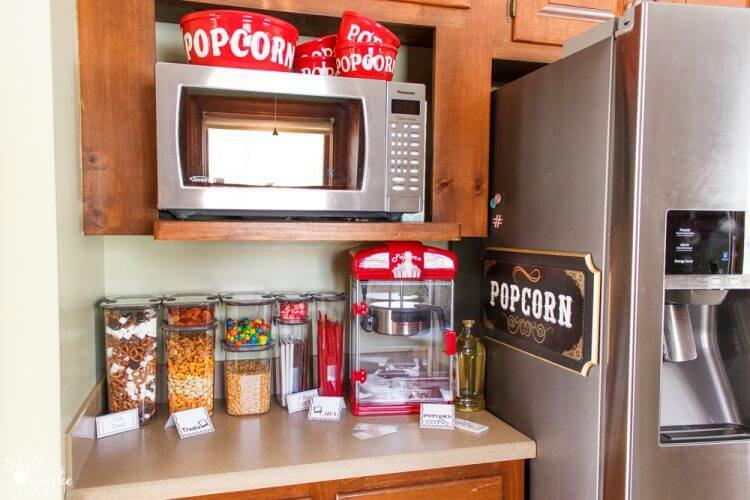 The gorgeous containers are now in the cabinet and look even better there along with the popcorn bowls. Now we open up the movie night cabinet and have fun pulling out whatever we want and need and it feels a little more special to not see it every day. 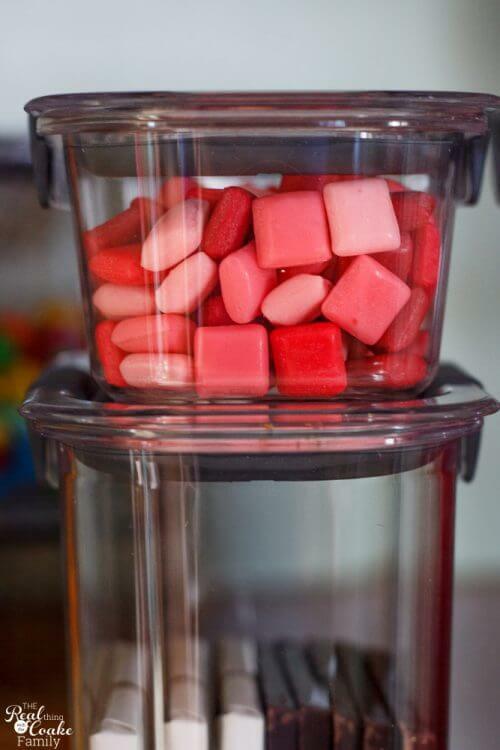 The clear, bright containers mean we can easily see exactly what we have in any space. Which is something great to remember about organization, just because you organize it one way doesn't mean it has to stay that way. If it isn't working for you for whatever reason, it isn't set in stone. Just work with what you need. Now, I just have the popcorn maker here. The cute little tickets we use for movie night (which you can see in this post) also fit perfectly in the cabinet. So, it was a winning solution all the way around. 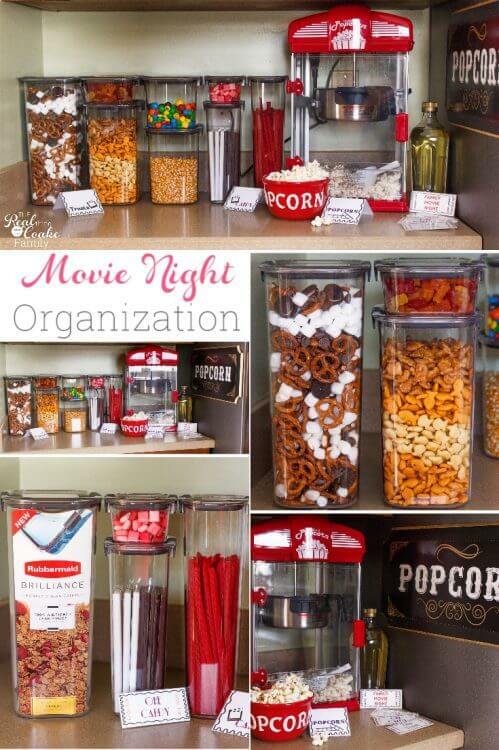 Move night fun and movie night organization! We can't wait for our next movie night. It looks like it could be a little while with my oldest daughter's theatre schedule, but it won't matter because the Rubbermaid BRILLIANCE containers will keep everything fresh. looking pretty, and deliciously waiting for us. 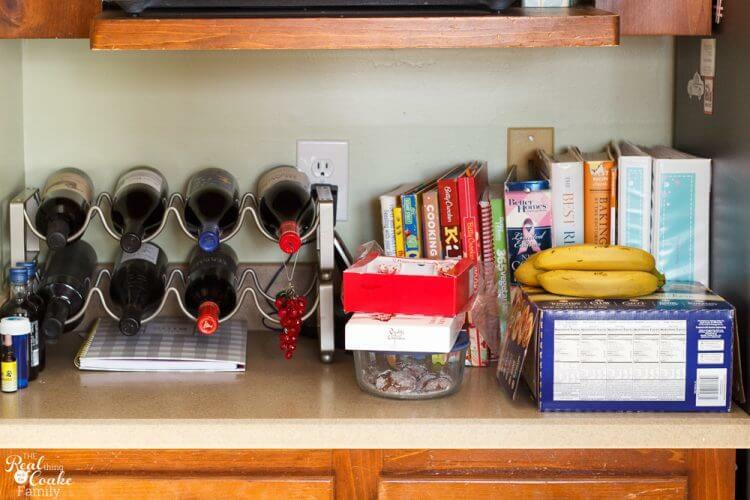 Looking for even more kitchen and pantry organization ideas? 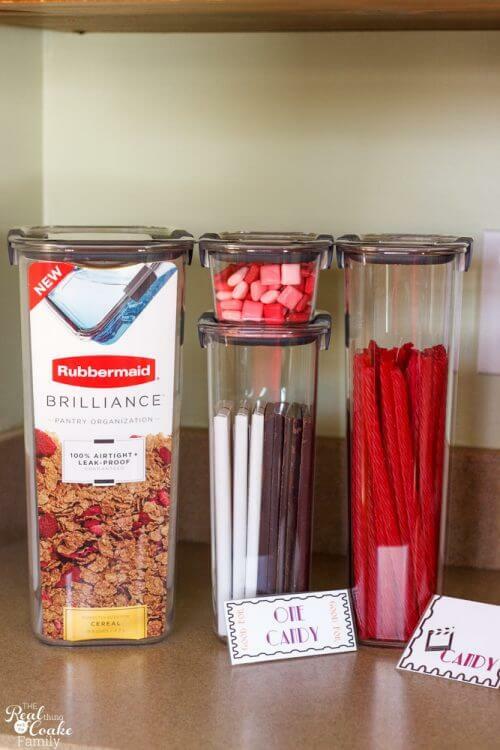 Check out more ideas utilizing the Rubbermaid® BRILLIANCE™ containers here! Do you have a family movie night? What kinds of traditions and treats do you have? How do you keep them organized? Leave me a comment below.